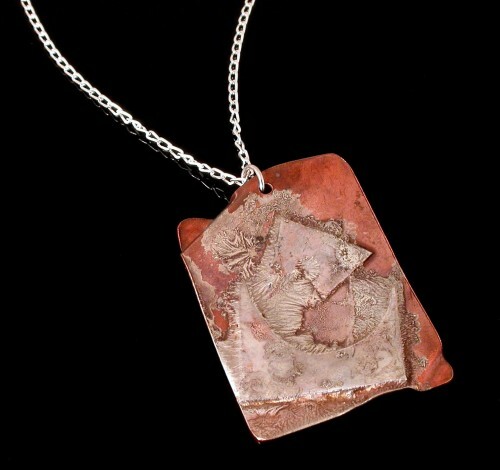 This pendant is part of the Fiery Creations Series, so named for both the process of creation which involves letting the fire "play" with the metal and the fiery look of the finished pieces. I continue to make this series because it's fun. I love the nearly complete lack of control and the lack of need for it. I decide the shape of the copper background and how much silver to put on the surface. Everything else is decided by the flame. Because of this, this suite feels primal and instinctive. It has a feeling of being both ancient and timeless, and the names of the pieces reflect that feeling. This series is made of copper, sterling, and fine silver. Each pieceâ��s surface is completely different. Incredibly well-matched, round, silver pearls dangle from Shepherd hooks. 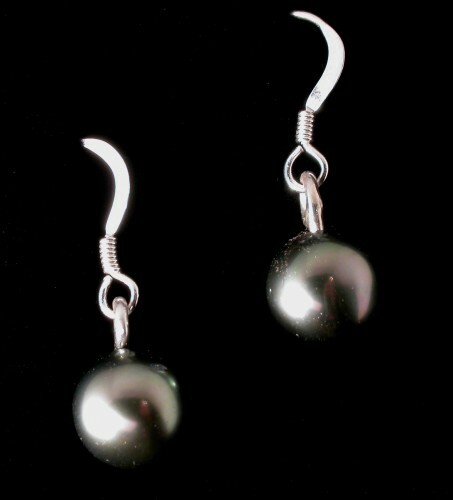 These 8 mm pearls are so silver that they actually reflect colours from anything around them. Each earring weighs only a gram, so they can be worn for long periods without discomfort. From the top of the hook they measure 2.3 cm. All earrings come with plastic earring stoppers (not pictured) to protect your investment. Dance is an abstract representation of the feeling of celebrating. 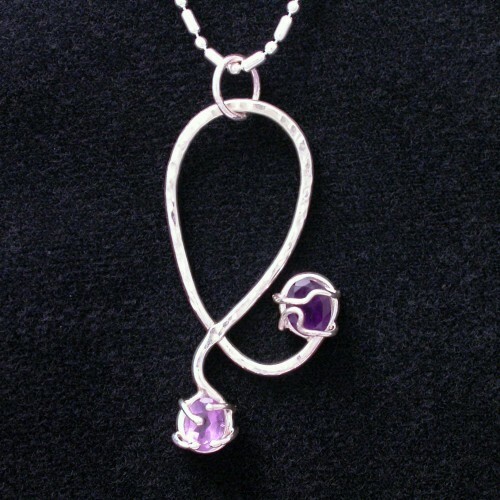 It is a pendant formed of sterling silver that has two striking amethysts of completely different shades of purple. The surface is hammered which means more shine because the light bounces off from many different angles. People smile when they see this piece. Maybe it will bring a smile to someone you know. Strength and Elegance. Vivid gold interior. Shiny sterling silver frame. Stunning Tahitian black pearl. This pendant, built on a series of circles, has everything you need. 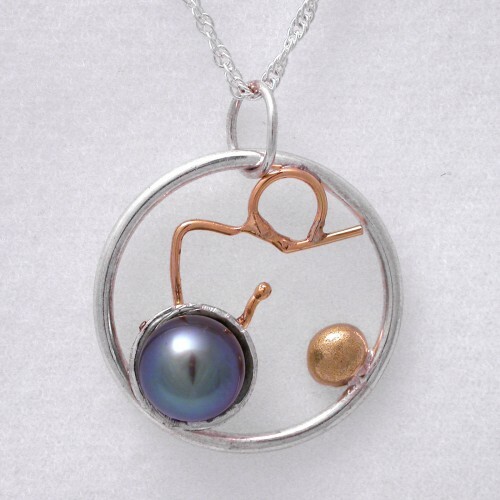 This pendant was created from sterling silver, 18kt gold, and a Fairly Traded Tahitian black pearl. It comes with the sterling chain it is displayed on.